When we moved to our new location, one thing we knew we would miss most was being across the street from Blooming Grounds! As luck would have it, they opened BG Express, now less that a block away! Yay! An updated site was needed to include their second location and a new logo. 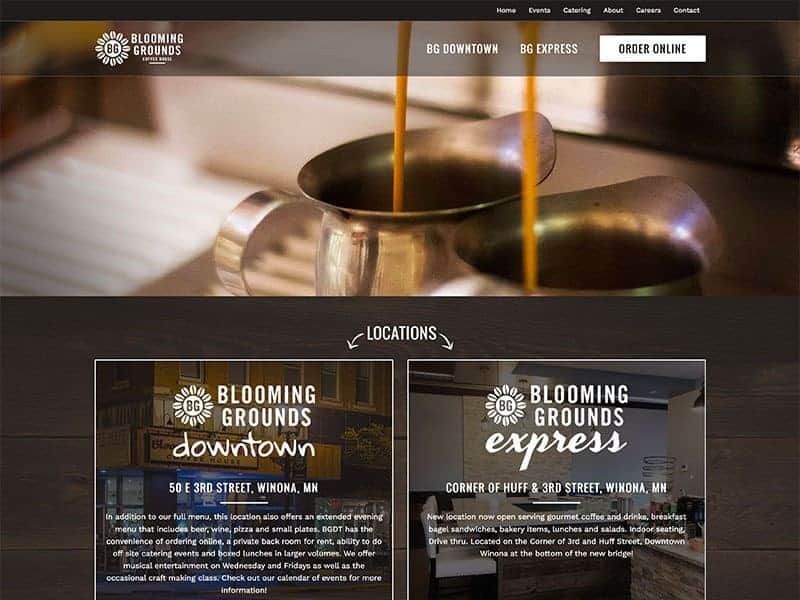 A complete redesign was put in place to capture those changes and communicate the new look at Blooming Grounds. The new site easily identifies the overall essence of Blooming Grounds while showcasing each location individually. Visitors can find menus, daily specials, order online and check out upcoming events. Incorporating social media feeds encourages visitors to also start following Blooming Grounds on Instagram and Facebook. Got a new look? Reach out to our team to help you show it off!